I arrived back in the UK to rain and gloom. Work tomorrow but before the horror of the pre-dawn stumble to the depot, I wanted to share with you a truly wonderful piece of cinema directed by Emmanuel Gras. At the “Florida” (the local Saint Savinien cinema) on Thursday night, there was an entertainment which probably could only happen in France. It was a folk concert, followed by a silent film about the life of cows. Entitled “Bovines, ou La Vraie Vie Des Vaches”, it is a beautifully photographed one hour and five minutes all about a herd of Charolais cows. French critics have awarded it many accolades but to me it says something about the unseen beauty of these animals. I have always loved cows and often photograph them myself. Of course, there is a sadness in their lives; always the menace of the livestock trailer and the abattoir. After a short period with the herd, the young males are taken for slaughter. We eat them. Then we take the milk from the mothers for ourselves. In the wild, the old, lame and young would be dragged down and devoured by predators. I do accept all this and often reflect upon it in a ridiculous hypocritical sirloin loving, leather shoe wearing angst. This film is not any sort of vegetarian propaganda or butcher’s promo. It is about acceptance, the cycle of existence and a reminder of the power wielded by man over his fellow creatures. More than anything it is about the notion of mind and consciousness. Watch the clip and I guess some will be surprised about what cows might think and their power of reasoning. The music, (please note my selfless struggle with the devil in the pundergrowth of obvious quips), was fresh, clear and completely out of my normal territory. They are brilliant musicians and I loved it. Following such a wonderful evening I was forced to reflect how lucky I am and how diverse we are. My main luck is to savour life in two distinct cultures and amongst such talented international people ranging across romantic novelists, poets,musicians, world commentators and thinkers with brains that must wear out their neck muscles. You know who you are and I love you. But when will you bloody well save me from the banal tosh of it all? Emma thinx: Acceptance is both sanctuary and prison. Hide a key. 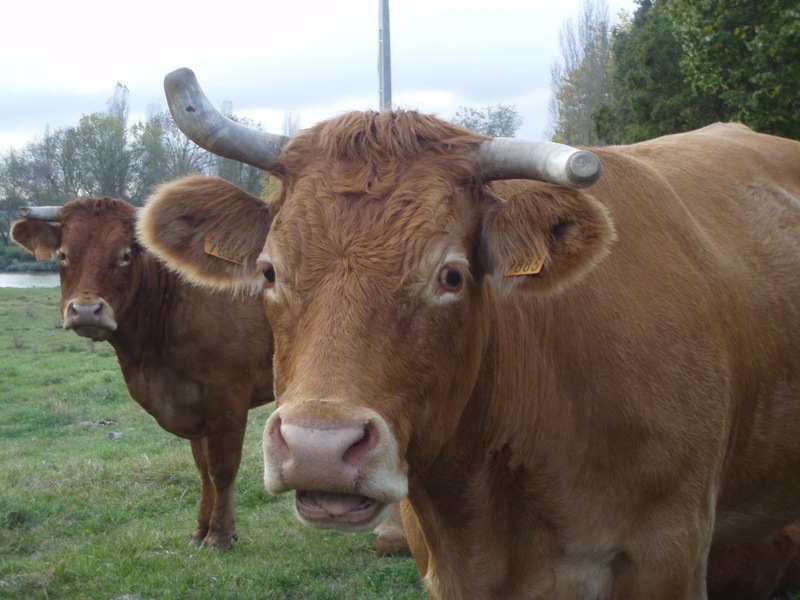 This entry was posted in bovines, cinema florida, Cows, Emmanuel Gras, la bergere, la vraie vie des vaches, Saint Savinien by emmacalin. Bookmark the permalink. Look as deep as you can into the cosmos and you will see stars, billions and billions of them, consuming themselves, just as ours does. Now use the most powerful microscope to peer deep inside molecules and cells and you will find matter consuming matter as it must wherever there is life. Is then all life evil, or are we simply dealing with the facts of life, neither good nor bad. I live in a place where countless cattle roamed wild, far more than the extant population could consume. Their carcasses were consumed by scavengers large and small. Ships came from New England to gather the hides, the raw materials of countless manufactured goods. Were the scavengers evil? Should these merchants have left the hides to rot? Such is life. I won't spend any time worrying about it. Cows? Yum. I thought the music was beautiful, your evening at the local cinema sounds wonderful. It's a difficult one, this idea of power over animals. I am not sure that is what we were put here for myself. I think we all arrive at a balance that is comfortable for us. I don't eat meat or fish, yet wear leather shoes and have an ancient leather jacket. I am ok with where I am and would not criticise others positions-damn big of you Paul. I think if we are killing animals than it is better to use as much of them as we can, and to ensure that if we are doing the killing we do so in a humane (if there ever is such a thing) manner. In a way i agree with Jack, there are other things to worry about, for example the huge number of babies that die every day or the fact a significant percentage of the population have no easy access to clean water. Acceptance should be the theme of human kind. Unfortunately, it's not. We only want to accept those like when those who are different from us are a lot more interesting. Interesting and thought provoking post. It sounds like you had a wonderful evening. The music, although not my usual fare, is quite enjoyable.